I have to apologize for not posting much recently. It is summer time, which means I’m busy wearing my ‘Camp Director’ hat at the arts camp I own. I was thinking about it and there really are a slew of options when considering what to do with your kids during the summer. It seems that just about any type of summer programming has the word “camp” tacked onto it; from sports and adventure to math and science camps, the choices can be overwhelming. As a parent, you search for a place where your child will be challenged mentally and physically while still having the time of their life. I believe young people have an amazing capacity to learn, inspire others and achieve challenging goals. However, they need to spend time in an environment that nurtures these capabilities. The arts challenge children to push themselves to reach new heights. Engaging in music, dance, theatre or visual arts provides kids with the opportunity to learn valuable skills that they can transfer to any aspect of their lives giving them a competitive edge to excel in whatever undertaking they choose. So maybe something that is so fundamental to the growth and development of children is the answer to your summer plans; arts camp! Innovation & Creative Thinking. By participating in the arts, young people are pushed to think ‘outside the box’ to come up with new and creative solutions to the challenges placed before them. In an acting workshop, a camper is asked to come up with 3 different ways to deliver the same monologue. A visual artist is challenged to transpose a memory to canvas. And a musician is pushed to come up with a new and exciting rhythm to enhance a piece of music. The arts, being creative endeavors themselves, will bring out and nurture the innovation already existing in our children. Problem-Solving. The arts are an excellent tool for developing problem-solving skills or what I like to call, finding solutions. Learning a new dance or musical score, creating a sculpture and even developing a new comedy sketch all pose problems that children will have to solve. By the end of the summer, campers start to learn that problems are not barriers, but rather exciting challenges that they can tackle daily. Teamwork. Sports programs aren’t they only way for kids to learn teamwork! Many arts disciplines are collaborative in nature, especially in the performing arts. By working together they can create a dance that is performed in unison, a musical composition that hits perfect pitch and a play that is seamless and entertaining. By participating in an artistic endeavor, they learn how to take individual responsibility, as well as how to collaborate and compromise to reach a common goal. Commitment and Discipline. It is no secret that to survive and excel in this world, one must stay disciplined and committed to one’s goals. The same goes for the arts! Through achievement, children learn first-hand the rewards for staying focused and diligent. Whether it is the rush of job well done or the joy of the audience’s applause, kids gain a true understanding of what extraordinary things can happen by persevering through life’s challenges. Trying New Things. 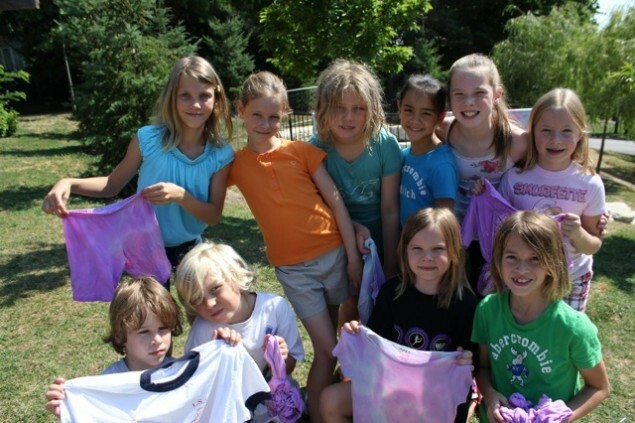 An arts camp provides the ideal environment for children to try new things. Art is not black and white, but many shades of grey. Arts camps that teach the staff how to encourage campers to explore new things are often the most successful at providing the support kids need to try and make mistakes. Sometimes things don’t always work as planned and that is ok! Through guidance from great camp role models kids find the courage to test out new paths that they might not otherwise get the opportunity to consider. Non-Verbal Communication. In particular, dance and theatre provide children with the opportunity to learn how to communicate through movement, expression and body language. As well, camp instructors provide coaching in specific performance skills that teach how to effectively communicate with an audience. A useful skill whether your child becomes an actor, professor or politician! Building Healthy Relationships. At arts camp, children interact with others in a completely new and different way. They act in plays together, dance, create music or collaborate on artistic creations. This is an important way for them to build empathy and understanding for their peers. Through these activities they form life-long bonds with like-minded kids based on mutual respect for their ideas, talents and values. There are countless skills that kids gain from being in an arts environment, but it is these 7 that lay a foundation for future success in life. Clearly I am a huge advocate for the arts, but for me, it is the unique combination of traditional camp activities and leadership development that truly makes the impact. Just last week I was working with Mandy, a 12 year old camper, who was struggling to find the confidence to keep trying new steps in dance class. She would give up and sit out every time it got a bit hard for her. My team and I worked with her to come up with a plan to keep her motivated to push herself without being afraid of getting it wrong. I said, “Forget about it being perfect, that is not what matters. It can take years to master a move. What matters is that you keep striving to do your best without giving up.” Now this camper is achieving more in dance than her instructor and peers thought possible! And what’s even more important is the boost of confidence she has gained in the process. By attending an arts camp, especially ones that are intentional about teaching leadership and life skills, children learn that they are capable of so much more than they thought, just like 12 year old, Mandy. It is the supportive and creative environment that nurtures and motivates young people to pursue their goals, whatever they may be. What greater gift could you give a child this summer?